You know those magical dining experiences that, in a way, leave you feeling as if you’re in love? Refuel, a casual fine dining restaurant in Kitsilano, recently had this effect on me. I set out for dinner on a warm Monday night not quite realizing what I was in for. A peek at Chef de Cuisine Jane Cornborough’s bio, however, did offer some rationale unto the brilliance later consumed. The well-traveled gourmet — who’s worked at New York’s famed Aquavit and three Michelin star Restaurant Daniel — trained under a slew of heavy hitting chefs, including Robert Belcham and Daniel Boulud. Jane is so passionate for her craft, that during her first black box competition, she cut both her hands several times, yet pushed through and presented her final dish with bandaged, gloved hands. Sous-chef Paulis was my ‘foodtender’ that evening at Refuel’s spacious kitchen bar. He’d clearly mastered the art of talking while cooking — in detail, he described my dishes, their ingredients (mostly local), and how they were prepared. The meal began with a bang; in this case, a crispy Foie Gras Croquette. It oozed controversial deliciousness. My taste buds almost could’ve left satisfied then and there. Epitomizing Refuel’s virtuous ‘nose to tail’ philosophy, a Crispy Pork Cheek Terrine was up next. Topped with a smear-worthy fried egg, Fraser Valley asparagus (delivered that same day), and a perplexingly tasty house made salsa verde (I later discovered the secret ingredients to include tarragon and capers), the dish was a wedlock of salty moistness. When ordering a salad, I pray for a mountain of greens. Being so light, a generous portion is appreciated. 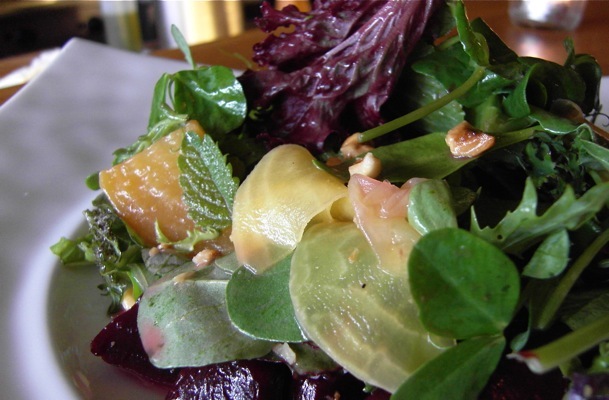 Refuel’s heaping Celebration Salad was like a soft, dense, honey-lime garden. Smooth pickled beets and crunchy toasted hazelnuts were the meat of this summer course, which was a perfect interlude between meatiness. Clam dishes consistently test my willpower. ‘Restrain from lapping up every last drop of the glistening broth with the butter-soaked, toasted bread,’ I told myself. But I couldn’t do it. Refuel’s Steamed Manila Clams were local. Their red chili-infused briny wiles kept my pathetic cycle alive. 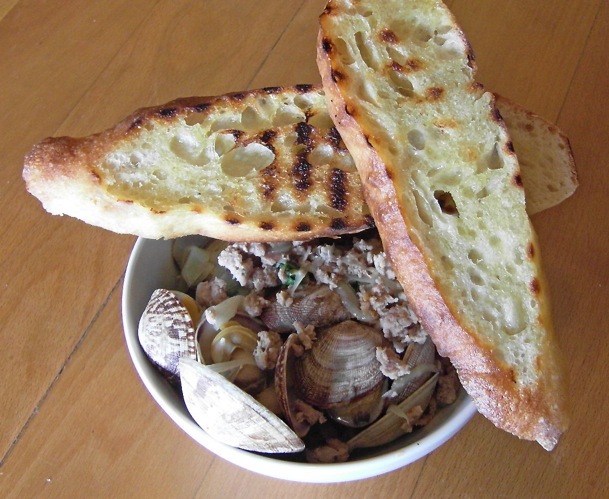 Bathing in the salt-free, white wine broth was fragrant ground fennel sausage — a perfect, salty pairing with the leaner shell-shielded meat. Campagnolo‘s in-house cured meats grace Refuel’s salumi boards. With a glass of wine in hand (I was drinking a recommended buttery chardonnay from Merryvale Winery), an entire evening could be spent nibbling, sipping, and lapping up the room’s warm, friendly ambiance. 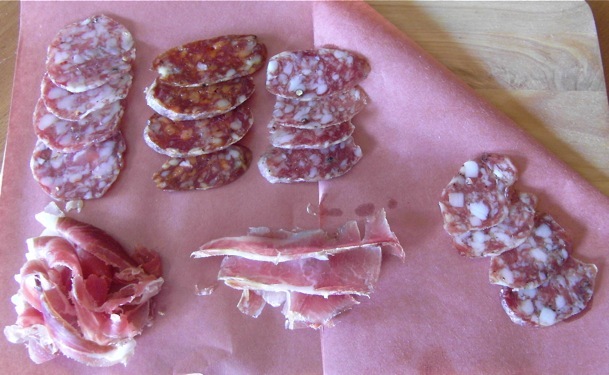 Pictured below: Fennel Sausage, Dry Cured Chorizo, Sauccison Sec, Fennel Pollen Salami, 18-Month Aged Ham, Coppa. Each had distinct, rich flavors. Ironically, the course I was least excited for was my favorite. You know how many dishes have a ‘best part’? Well, in my dinner notes, I have ‘fav’, ‘fav’, ‘fav’ written after each major ingredient seen below. The two triangular slabs of polenta were exceptionally moist with an extra crispy, golden exterior. I dabbed each bite in the faintly spicy creme fraiche mayo sauce. 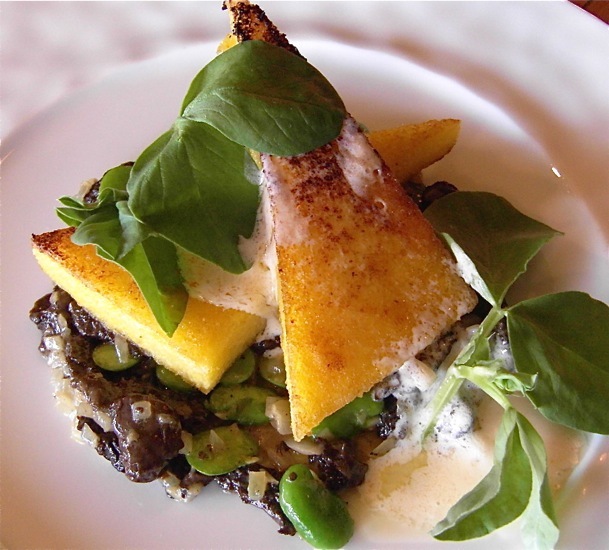 Like silk, high quality olive oil coated the morel mushrooms and the plump fava beans. It really was a winner. If you order one dish, order this. …house made honeycomb (a buttery, life changing crunch), pure house-churned vanilla ice cream, velvety whipped peanut butter mousse, and chocolate ganache. Together on the spoon. It was heaven. And I’m not even a ‘peanut butter person’. 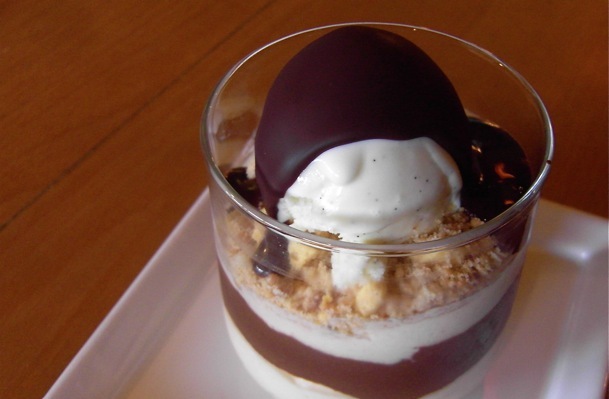 For your own sake, add this dessert to your list of dishes to eat before you die. Making a trip to Refuel for this dish alone wouldn’t be out of the question, either. So, how on Earth had I not visited Refuel before? 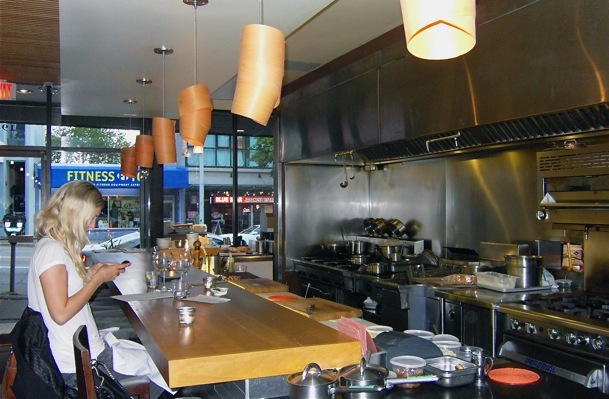 Excuses aside, I’m now aware and have added the wonderful, lively, sustainable Kitsilano restaurant to my list of ‘Best Restaurants in Vancouver’. From appetizer to dessert, I savored each bite, each sip, and each minute of my experience. Thanks to Rob for the flawless and friendly service, to Paulis for the fantastic kitchen bar show, and to Jane for bringing her awe-inspiring talent to our wonderful neighborhood, Kitsilano.